Back in June, I painted the cupboards of my new kitchen black (Kitchen Redo #2: Black Cupboards & Some Extras) and planted a little bug on my plans for this super plain pantry door. I have been gathering my ideas (thanks to Pinterest and Houzz) and have found so many cute ideas for a plain pantry door and I thought I would share a few with you. At first I was thinking about a chalk board door. Great for writing future menus, plans, grocery lists, and a place for Aiden to draw. I loved the curved arch on the door below. However, I have a flat door so I am not sure how that would work on my door. 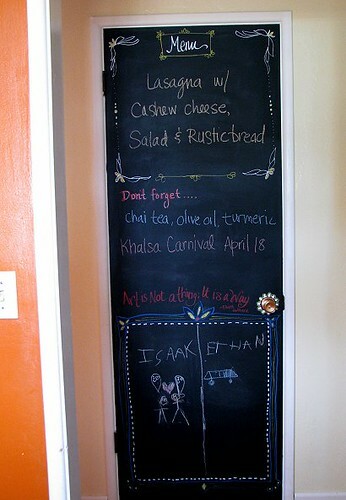 Here is another chalk board door. I love the way they have used chalk markers to decorate the door. I think the chalk is great, but I think of the chalk mess and wonder if it’s all worth it. I saw this photo below and though I know that it’s a front door of someone’s house, I really liked the illusion of a frame the squares added. I thought it might add a nice little decorative feel to the door without looking like a strange black door in the kitchen. Then there is always the option of a dry erase pantry door like the one below. Very cute with the paisley pattern on the door, but then again I have a flat, ugly door. Also, I am not sure I can trust my toddler with markers and I would like this door to serve as an activity space for him while I cook. And finally, I could always go with the cute frame option: one cork, one dry erase, and maybe one magnetic. I think this idea would be very cute, but I worry about the toddler ripping off the frames attached to the door and how do you attach them when you have a cheap, hollow, door like I do? 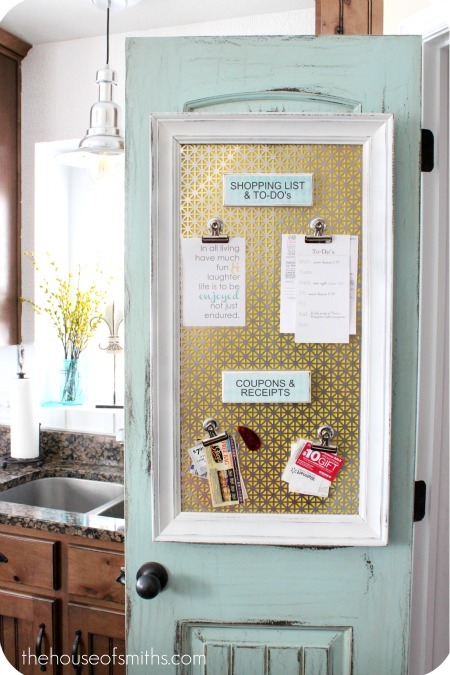 There are so many cute ways to redo your pantry door out there, the ideas are endless! I guess decisions have to be made and I will show you what I decided to do on the next blog about the door! 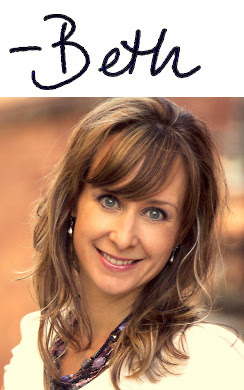 Have you thought about using chalkboard paint or chalkboard cloth to make the chalk board areas? They also make magnetic primer so that magnets are attracted to the surface. The nice thing about chalkboard cloth is that you cut down on the mess because it is washable. Thanks Katie for the suggestions. I actually ended up going with magnetic paint with chalk paint on top of it. I just need to write up the blog, hopefully it will be posted in the next few days. Thanks for the suggestions!